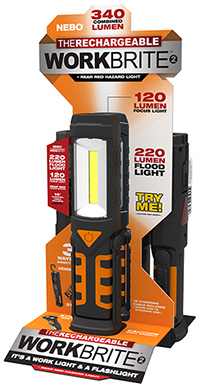 (Grand Prairie, TX – July 10, 2015) This summer, NEBO debuts its most versatile work light yet with the release of the WORKBRITE 2™ as well as a Rechargeable version. Both the WORKBRITE 2 and the Rechargeable WORKBRITE 2 feature a high-power C•O•B LED work light as well as a powerful flashlight, and a rear, emergency red flasher LED. The new WORKBRITE 2 provides hands-free lighting in three different ways: a hanging hook with 360 degree ball-joint, a 200-degree pivoting stand and a magnetic base. Whether working in a garage, under the sink or just out in the dark, the WORKBRITE 2 works great for any application. The WORKBRITE 2 is water and impact-resistant and is designed with an ergonomic, non-slip grip. The powerful magnetic base allows users to secure it to any metallic surface. C•O•B (Chips on Board) is a new innovation in LED technology. C•O•B features smaller, easier clustered LED chips that are mounted directly to the circuit board. These LED chips work together as one lighting module. Because of the compact design, C•O•B outperforms traditional lighting by up to 50 times the light output per centimeter of light surface. The WORKBRITE 2 will begin shipping in July, 2015 in 12 piece case packs. The MSRP is $19.99 for the WORKBRITE 2 (#6304) and $29.95 for the Rechargeable WORKBRITE 2 (#6305). For ordering or additional information, visit www.nebotools.com or call 800-255-6061.